Skyward Sword + Ocarina of Time 3D: A Connection? In case you missed the breaking report a couple weeks ago, Aonuma recently confirmed in two interviews with Official Nintendo Magazine and Nintendo Power that Skyward Sword is a prequel to the longtime first story in the Zelda timeline, Ocarina of Time. The news was not all that surprising to most given that the Master Sword’s origin was already a known element of the story, but what no one has yet to discuss is that this announcement comes alongside the development of a full remake of Ocarina of Time for the 3DS. While we know that changes to the original game are already on the horizon, notably among them the interface for swapping out Link’s equipment, could the timing of this release possibly have something to do with the upcoming Wii adventure? One of Nintendo’s favorite gimmicks for their handheld consoles is hardware inter-connectivity. First the GameBoy introduced communication between different GameBoy systems, then the GameBoy Advance added connectivity with the GameCube, and most recently the DS has included wi-fi support as well as wireless communication not only with other DS units but with Wii. Handheld iterations of Zelda have never been left out of the trend: Link’s Awakening DX made use of the GameBoy Printer peripheral; the Oracles games featured a linked story that spanned two cartridges; Four Swords and Four Swords Adventures had multiple players participate in one adventure; The Wind Waker could connect with a GameBoy Advance for the Tingle Tuner sidequests; most recently Phantom Hourglass and Spirit Tracks used the wireless capabilities of the DS to allow for multiplayer matches and item-swapping between players. Now that we are concentrating primarily on Wii, we are also thinking about what we can do on 3DS. I think that it’s really nice when you can have two different platforms and you create a title that branches over both of the platforms, and each influences the other. With interconnectivity between Wii and 3DS already on the drawing board, the questions we must ask then become: first, does this prophecy include Ocarina of Time 3D, and second, how might Nintendo implement those features in an effective way? Setting the first query aside, I think that if this remake plans to make use of these capabilities, it’s clear that Skyward Sword will be its Wii counterpart. The new prequel offers the perfect opportunity to share information between software across multiple platforms, and for Nintendo to keep their long-awaited retrofit of Ocarina fresh while still pleasing old fans. I have a few ideas as to how Nintendo might handle such an approach, should they choose to take it. When A Link to the Past came to GameBoy Advance, the pack-in multiplayer title Four Swords came with it. In order to motivate players to complete both games, Nintendo added a new dungeon and mini-game to A Link to the Past that required a finished Four Swords file. They also locked the Sword Beam feature in Four Swords, previously a staple of the 2D top-down perspective games, until players obtained the Master Sword in their Link to the Past game. This was a unique approach that made the games feel connected beyond simply appearing on the same cartridge. It would be simple to translate a feature like this to Skyward Sword and Ocarina of Time 3D. Since we know that at some point in the new Wii game the Skyward Sword becomes the Master Sword, let’s say that once players reach this pivotal moment, if they turn on their 3DS, they can transfer the Sword Beam move from Skyward Sword to their Ocarina file. 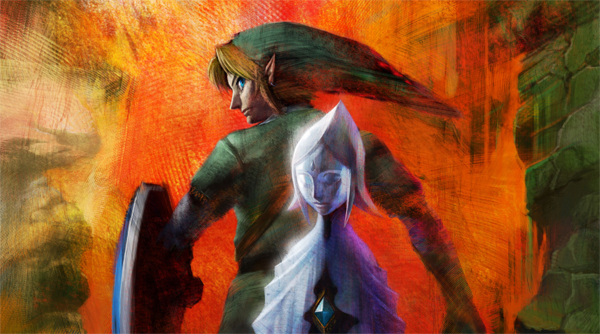 In order to access this ability, players could bring an Adult Link, already armed with the sacred blade, to the Temple of Time to receive the upgrade from his past incarnation. If necessary, the layout of the Temple of Time area could change accordingly, just like the room to change characters in Peach’s Castle from Super Mario 64 DS. These wouldn’t be particularly invasive additions. The Sword Beam was, after all, originally supposed to appear in Ocarina of Time, and was even shown in screenshots published in Nintendo Power all the way up to release! Of course, there could also be perks that transfer from Ocarina 3D to Skyward Sword, such as the infamous Biggoron’s Sword or even the cow Link can win from Lon Lon Ranch. The Oracles games already experimented with item transfer with great success, so the idea already has a solid foundation to build upon. If Nintendo wants to go the extreme route, they could even add new overworld locations (or update old ones), shared items, more sidequests, and new or deepened cutscenes to further connect the two games. While we don’t know enough about Skyward Sword to be able to speculate on what these changes might be, the prospect sends a shiver down my spine nonetheless. Is this what Aonuma had in mind when he mentioned cross-platform connectivity for Zelda? I don’t know, but I can’t wait to find out. The Skyward Sword Speculation Series is a new regular column that will focus on speculated possibilities for Skyward Sword‘s gameplay and storyline. The idea came from a general speculation article we published in the wake of E3. While we try to make our guesses based on confirmed or suggested facts, bear in mind that they are still just that – guesses – and may or may not prove to be true, or even at all accurate.